Last May, Cyclone Roanu claimed over 100 lives in Sri Lanka and Bangladesh, and left tens of thousands in need of aid. Officials are looking to the sky for information on flooded areas to analyse the cyclone's aftermath and support emergency response activities. 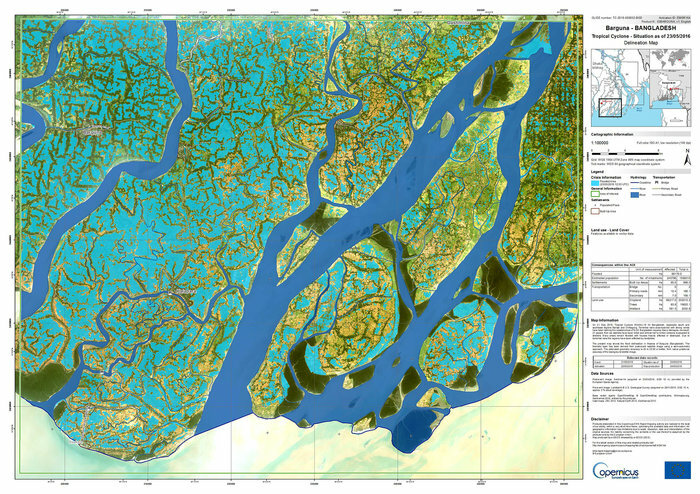 On May 23rd, the Sentinel-1A satellite captured about 80% of the country of Bangladesh during a single pass. The images were quickly delivered to the Copernicus Emergency Management Service (EMS) to create flood maps, revealing over 170 000 hectares to be inundated. Want to know more about this image? Then be sure to check out the article here.